Source: Montreal Daily Star. 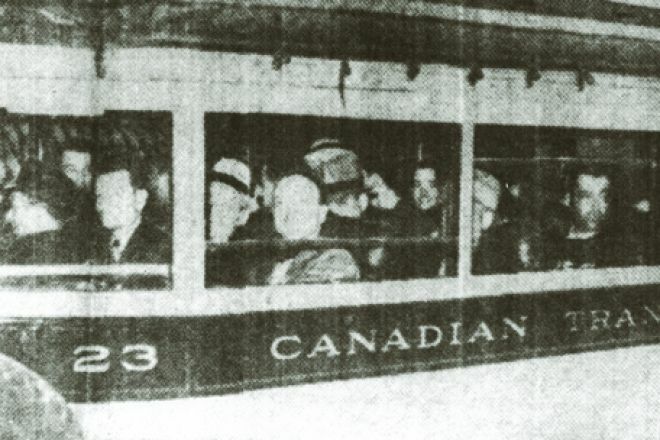 Busload of Italian Canadians bound for internment camps in June 1940. Courtesy of Joe Fratino, Casa d'Italia, Montreal. In the wake of September 11, we find ourselves once again debating these sensitive issues – balancing human rights and civil liberties against the need to ensure the safety and security of Canadian citizens. But, of course, this is not the first time that ethnic profiling has been used in attempts to ensure the security of Canadians. Many in the Italian Canadian community will remember the events of June 1940 and recognize the terrible symptoms of ethnic profiling. The present debate provides compelling reasons to reconsider the internment of Italian Canadians (and members of other ethnic minorities) during the 1940s – to remember those events and to try to comprehend the curious dynamics at work there, particularly as they affect the ways in which the Italian Canadian community conceives and represents itself today, some sixty years after those events. Mario Duliani’s chronicle The City Without Women, translated by Antonino Mazza, can be useful in this regard. 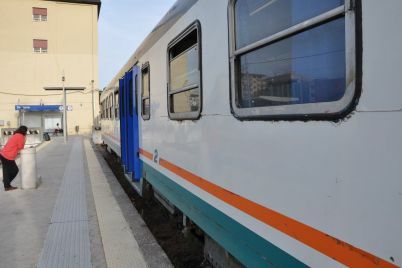 Following its publication in English in 1994, The City Without Women has attracted attention within the Italian Canadian community and has fuelled a heated debate among scholars. Some maintain that Duliani had ties to fascist organizations and that his internment was justified; for others his account of internment provides support for the campaign to seek redress from the Government of Canada for the wrongful imprisonment of innocent people. Regardless of the author’s political leanings, Duliani’s The City Without Women offers valuable insights into the Italian Canadian identity at the time of World War II, both within the internment camps and beyond. More importantly, our response to those events and to Duliani’s chronicle of that experience, illustrates our need to fashion and promote a particular image of Italian Canadian identity, against conditions that threaten to sweep those historic events onto the periphery of our collective identity. So what can we learn when we consider Duliani’s book in relation to collective memory and the ethnic identity of Italian Canadians today? One thing that becomes clear is that the relationship between memory and identity evolves over time. The efforts to seek redress are probably well intentioned – to right a past wrong, to seek restitution as a means of making peace with the past, to reclaim our dignity and clear our good names. We grasp at these events of some sixty years ago because they stand as documented historic events against which we can feel justifiably outraged. But there is no unified response to those events, or consensus as to how to seek redress, or even whether we should seek it. The community is fractured in its response, and the issue of internment is receding in importance and impact for younger generations of Italian Canadians who are further and further removed from those events, and from those who suffered through them. Hence, as an issue on which to develop a sense of collective identity, its appeal is understandable, convenient, but ultimately ill-fated. As Duliani describes their plight, internment is the cause of undeniable suffering for the internees, not from their material existence, which is quite satisfactory, but rather as a result of what he calls “ethical disquietude” – the fact that none of the men interned had committed any act of treason; they had merely made the mistake of expressing outwardly their sympathy for a government that had later declared war on Canada. Duliani’s description clearly conveys the sense that the loss of dignity, even more than the loss of freedom, was the hardest blow to withstand. Perhaps for some of these “enemy aliens” interned, the separation from loved ones was so excruciating because it was analogous to and replicated, at an emotional level, the pain of separation from their homeland – the mother country they had left behind to settle in Canada. So the pain of internment was, in a way, like being rejected by an adoptive parent. One point that is clearly established in Duliani’s account of the internment experience is the important and sometimes conflicting role played by memory. The memory of loved ones, of familiar faces, places and objects, could be a great comfort at times to those interned; but at other times these same memories, and the separation they were forced to endure, became a form of torture. The duality of memory is no less true for us today. For ethnic communities, memory can be painful, but it also helps to consolidate a sense of collective identity. Attempting to assess the impact of the internment of some 600 Italian Canadians during the 1940s on the Italian Canadian community today is problematic. How can we possibly hope to quantify and measure such a strange occurrence or its effects projected over time? – events whose impact was in all likelihood, devastating, perhaps even insurmountable for some whose lives were directly touched, but whose effects cannot be the same for subsequent generations. I can only relate my own experience and try to discern how it fits into this puzzle. I had no knowledge of these events before I began to pursue this topic as an academic interest. And when I did so, my initial orientation was informed by academic standards. I set out to conduct scholarly research and to be “objective” in my approach. For me, the impact of the internment of a few hundred Italian Canadians (some of whom could have been my uncles) in the 1940s has, I think, been relatively small. I do not feel fundamentally formed (or deformed) by it; I do not feel that it affects how I think about being of Italian heritage; it rarely crosses my mind. It does not make me particularly sad or angry to think about it; I think about it as history. When my Aunt Lena describes the anxiety, the disappointment, and the deep hurt that crushed my paternal grandfather on that morning when he arrived at his fruit store on Vaughan Road and found the store windows defaced by anti-Italian graffiti and anti-fascist slogans – ironically, at the same time that his only son (my father) was serving in the Canadian Forces overseas – it helps me to comprehend the lasting impact, the emotional residue of ethnic profiling on that generation of hyphenated Italian Canadians. So how are we to move forward toward a meaningful understanding of these events, in themselves and in terms of our current situation? Why do we continue to pursue this issue? Why does it matter? Perhaps because our cohesiveness as an “ethnic community” and as an ethnic minority is breaking down, being slowly eroded and slipping away. At the same time, we find ourselves facing difficult issues around ethnic profiling once again, and we recall our own history and experience as the subjects of such legislation, policies and security measures that were, and remain for some, the cause of so much hardship, shame and suffering. Reflecting back on the internment of Italian Canadians can move us to better understand ourselves as an ethnic community affected by historical memory and to respond to the difficult security issues we face once again involving aspects of ethnic profiling. My brother used to say that the first thing you should do when you got into an Italian sports car was to throw away the rear-view mirror because “what’s behind you doesn’t matter; it’s only what’s in front of you that counts.” But the case of the internment of Italian Canadians demonstrates how sometimes the occasional glance in our rear-view mirror can help us to navigate the difficult road ahead. Jim Zucchero grew up in Toronto and now lives in London, Ontario. He is a counsellor and instructor at the University of Western Ontario.